I had a great question from my friend about why to use a kitchen scale instead of just measuring things by volume with measuring cups. It really comes down to how much of a baker you are. The method used to accurately measure flour by volume is the “dip-level-pour” method, whereby you scoop loosely some flour into a cup and use a knife to scrape the top level. I hate this method because it always got my counters covered in flour no matter how hard I tried to do it over the container. If you are the type who just pours flour into a cup from the bag, chances are you are getting the wrong amount of flour in your cup or you are also spilling it! Cooking doesn’t require the same accuracy that baking does, but if you bake a lot you will find using the kitchen scale technique is not only faster, but will result in better baked goods as well. And while you’re at it, think about the way you organize your kitchen. Think of your kitchen in “zones” that you use to do different things. So for now we’ll just focus on the Baking Zone!!! If you want to switch to using a scale, you may have to change the way you store your baking ingredients. Use large air-tight canisters for flour and sugar. Get ones that fit an entire five pound bag plus a little extra. Keep a measuring cup in each one at all times. (I have a 1 cup and 1/3 cup for the flour, and a 1/2 cup and 1/8 cup for the sugar). When you want to make a baked item, put the bowl from the mixer on the scale and zero it. Then keep dumping and sprinkling the flour until it’s the right measurement. The measuring cup goes back into the flour without having to wash it and without getting flour all over the counter. Zero the scale and do the same with the sugar! 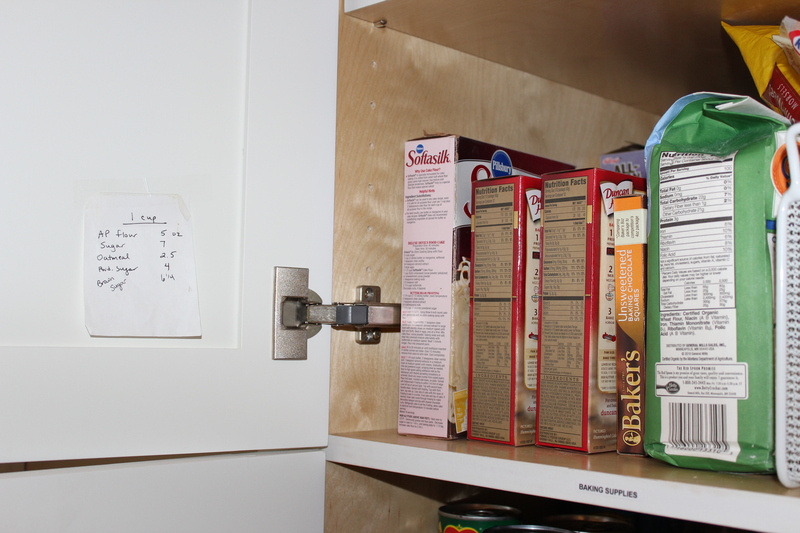 I keep a copy of the most common ingredients I use taped on the inside of my upper cabinet door, along with my top 5 baking recipes, so if I forget it’s within easy reach. And if those aren’t enough for you, here are two more websites with loads of weights! I’d love to hear what YOU think! How do you organize YOUR baking zone? 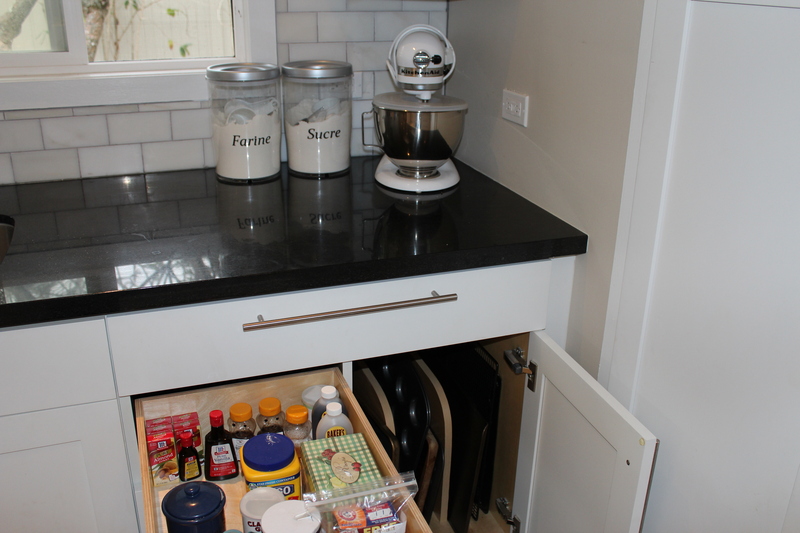 This entry was posted in Home Organizing, Kitchen and tagged baking zone, flour, kitchen, organize, scale, sugar, volume, weights, zone by organizedohana. Bookmark the permalink.